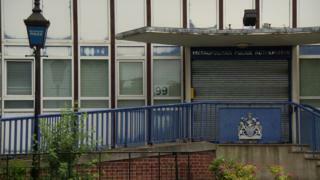 Half of London's police station front counters will close under new plans announced by the Mayor of London. Sadiq Kahn said budget constraints had left him "no choice". Scotland Yard estimates it will need to make £400m of savings by 2020 under current funding. Under proposals each of the Met's 32 boroughs will be left with one 24-hour counter. There are currently 73 working counters, down from 136 since 2013. Conservatives said the mayor was using government funding as a "scapegoat". London Assembly member Gareth Bacon said: ""The fact is the Met has found three quarters of the savings it requires and no announcement has yet been made about future funding." Mr Khan set out the new plans in a consultation document on public access and engagement published on Friday. City Hall says that closing "poorly used" front counters will save £10m each year - equivalent to the cost of 170 police constables. Since 2010, the Met has had to find £600m of savings. Some 8% of crimes were reported at police front counters in 2016, down from 22% in 2006, according to official figures. About 70% of crimes are reported by phone. Under the plans, remaining police buildings will get upgraded IT services while frontline officers will be provided with tablet computers - in an an effort to boost the reporting of crime online. Mr Khan said: "The huge government cuts to the Metropolitan Police Service have left us with no choice but to take drastic action to protect the frontline of policing. "My top priority is keeping Londoners safe, and every pound saved by closing a front counter is a pound of savings that we do not have to find by reducing the frontline." When former mayor Boris Johnson cut police station front counters in 2013, Mr Khan criticised the move, suggesting Londoners could be forced to report crime at police "contact points" in McDonald's restaurants. The Home Office said Scotland Yard has had a "broadly flat" budget since 2015. A spokesman said: "There is more money and more officers for each Londoner than anywhere else in the country. "This government will continue to ensure that the Metropolitan Police have the resources they need to cut crime and keep our communities safe." The public consultation is open until 6 October.